SuperTree Dining provides an all-inclusive family dining experience in one of Singapore’s newest icon – Gardens by the Bay. Located by SuperTree Grove, SuperTree Dining features five distinctive F&B dining concepts in a common dining space, from dim sum at Peach Garden Noodle House to hawker favourites like Nasi Lemak at Hill Street Coffee Shop to western fusion at Oriental Western & Bistro. Offering a diverse range of local and international cuisines to choose from, SuperTree Dining caters to the different budgets and tastes of visitors to Gardens by the Bay. 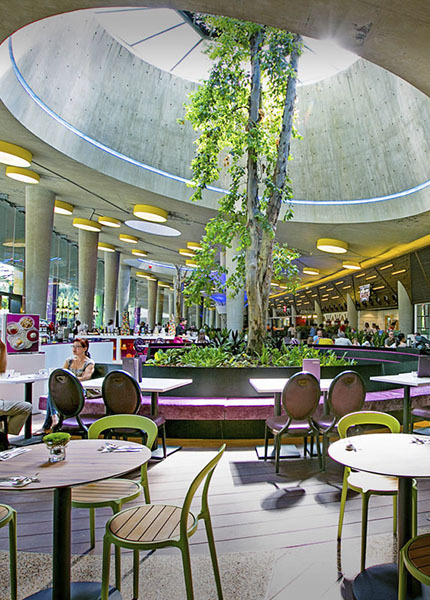 Coupled with communal seating, which allows for bonding time, there is something for everyone at SuperTree Dining. SuperTree Dining features floor-to-ceiling glass windows enabling diners to look out to the lush, tropical surroundings as they bask in the natural sunlight that streams in while remaining comfortably sheltered. When night falls, diners can enjoy the light display on the SuperTrees while savouring a wide range of local and international delights.